Even the most popular bands can have off days. 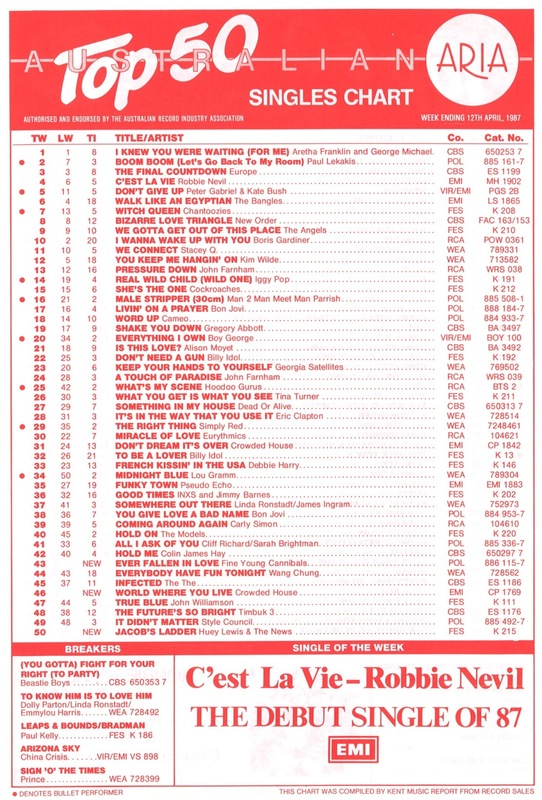 Or, as was the case this week in 1987, singles that don't connect for whatever reason. Two bands that'd only recently enjoyed worldwide success stalled between numbers 40 and 50 with their latest releases. And we can probably blame the fact that they were selling too many albums, since there was nothing wrong with either song. A single that had no trouble whatsoever shifting units was still at number 1 this week in 1987. 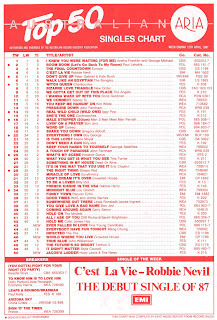 "I Knew You Were Waiting (For Me)" by Aretha Franklin and George Michael spent a fourth and final week on top. If "When I Think Of You" couldn't even make the top 50, there was no way the less melodic title track of Janet Jackson's breakthrough album was going to. It wasn't quite over for Control, with two top 50 singles left to come. Huey Lewis And The News were really on a roll in the States at this point, with this latest release from Fore! becoming their third number 1 hit out of the past four singles. Written (and later recorded) by Bruce Hornsby and his brother John, "Jacob's Ladder" told the tale of an everywoman who preferred to just get on with life than accept the false promises proffered by the types of TV evangelists that were so prevalent in the US at the time. Despite being as catchy as you'd expect - thanks to its "step by step, rung by rung, higher and higher" refrain - the song didn't really catch on locally, probably because Fore! hadn't left the top 20 on the albums chart since October. The band milked a record two more US top 10 hits, "I Know What I Like" and "Doing It All For My Baby", from the album, but the latter, which was the only one of the two released in Australia, failed to chart. While Huey Lewis And The News and Crowded House struggled with their latest singles, Fine Young Cannibals had no such trouble, racking up a fourth top 20 hit. Then again, their cover of the 1978 punk classic by Buzzcocks was a brand new release not found on an existing, top-selling album. "Ever Fallen In Love" was included on the soundtrack to Something Wild and featured footage from the Jonathan Demme film in its cinema-set music video. The track wouldn't be included on a FYC album for another two years, when the trio finally got around to releasing The Raw & The Cooked. Next week: two of the biggest acts in the world return, plus the arrival of one of my favourite female duos of all time. And rap music gets a little whiter thanks to the debut hit for a pioneering hip-hop trio. I love the dialogue/monologue intro to the 'Control' video... more than the song. Rage had a Janet special in '95, and a friend at school and I learnt the dialogue intros to this and 'What Have You Done...' from it and would re-enact them for our own amusement (yes, really). I still know them off by heart. The Kent Report new releases lists have 'Doin' It All (For My Baby)' getting a local release in June, but no listing for 'I Know What I Like'. I'm surprised 'World Where You Live' missed the top 40. 'Ever Fallen In Love' would be one of my 3 favourite FYC singles.